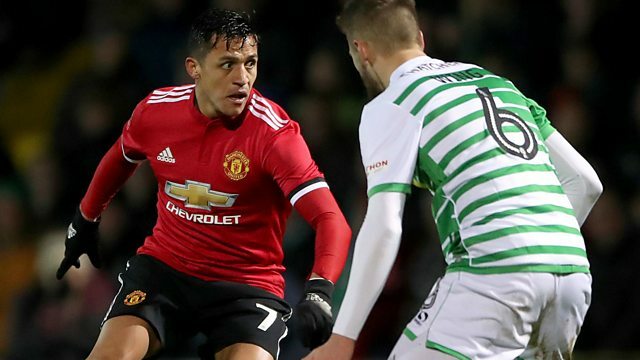 Live coverage of the FA Cup fourth-round tie between Yeovil Town and Manchester United. Browse content similar to Fourth Round: Yeovil Town v Manchester United. Check below for episodes and series from the same categories and more! What a moment! Aaron Ramsey scorers! Yeovil are in the fifth round. They have signed Alexis Sanchez? my lover, come on Yeovil! big team coming to town. millions of people in the FA Cup. for him. I do not know what to say. that! Have you ever played here? I think you will find that you did. the last knock in. It was brilliant. Burnley. Romero has on the gloves. first time since that heart scare. told his story to us. sharing the events of what happened? could be out of here soon. dearly were not here to enjoy it? down to play on my testimonial. serious, can it, as important? you told him he was on the bench. will see you later. Well done. nine hours in a car. would not fancy that. There he is. do the same thing! With your ankle? Even if you asked me now. couple of training sessions with us. want to stay. It was not difficult. give Jose Mourinho extra pleasure. himself. The keeper has no chance. about it, he will improve them. us go back to Dan. desperate for the game to start. He was shocked to see me. sure you're not sharing information. has done to get to this stage. minutes, the confidence will grow. viewers are not bored of us. an upset or even a draw? fourth round of the Emirates FA Cup. above the drop zone in League Two. rafters, 9000 inside Huish Park. only Jimmy Young. -- Julianne Phil. pit his wits against Jose Mourinho. and was ruled out of the tie. balls forward. Away by Herrera. him. That is for sure. players if you went there as well. thought City were the better team. affected by Sanchez being there. if it will cut up a little bit. locker, in the form of Ryan Dickson. There it goes. Won by McTominay. first chance of the game. A little taster of his pace though. James. Safely in the end by Romero. really sharp on the left-hand side. might do. Almost came to Sowunmi. that young man as well. Otis Khan, the top scorer. there's nobody getting in there. three years ago from Exeter. years ago, in their 2-1 win here. A foul by Rojo from Surridge. proud of your club for one day. he's too quick for Darmian. that, really. It's a great ball in. in that position, don't you? very difficult one for the linesman. Rashford a little isolated there. the on loan from Barnsley. Surridge who went to ground. think Rojo was happy with that. Dickson. A Manchester United throw. season in the Cup competition. better of Darmian once more. play in that central position will. There are a bit slow at the moment. the Welsh man. Tom James. opponent. A good ball to Sanchez. He's got Rashford up with him. Marcus Rashford, taking on James. goalkeeper. Did well, the keeper. overruns are a bit, the keeper. front of him, that's for sure. Sanchez will get to that. acquitted himself well so far. the 12 times winners of the FA Cup. really well, just fingertips save. Out of play by Rojo. That's a useful run from Dickson. live tomorrow, BBC One from midday. BBC One on Sunday from 3:35pm. nice and positives, wins it. like that in your career. intentionally, no. A little reducer. Oh dear. I felt that appear. will want to take this. long hard look at this. everyone is fit and available. will be some committee meeting. at a new club, isn't he? team. Aren't City the best team? the money, you'd stay with the BBC. That's very kind of you, Martin. three years ago, Ander Herrera. of Yeovil Town is concerned. He did not get there. Foul on Green. Darmian looking for an option. waiting for some support to arrive. to do with that ball straightaway. is a Yeovil free kick. wonder goal. Is this the moment. in by Bird. But blocked by Rojo. Darmian. Swept in by Dickson. halves are going up and staying up. Mata brilliantly. Mata went alone. Sanchez again giving the ball away. that central area almost unnoticed. of that, he could have caught it. from Rashford and here goes Sanchez. Manchester United are in front. punish you at this level. gone the way of Manchester United. United. Given it away again. been so far on the left. there was a bit of a clock up. You can see what it means. that the players have with him. made any kind of safe there. we saw often saw him do at Arsenal. far out on the left. see him playing on the right? feet are off the ground. They just got to half-time. tension in a moment like this. this is it, I am going to shoot now. a great keeper, great lad. Manchester City on Sunday afternoon. Darren waits say at half-time? sorry, but it is the Arsenal man. what happened in the first half. ranked team left in the competition. one. Safely taken. Here comes James. are to get back into this game. to play in the Football League. winning the Conference back in 2003.
another saw one for Sanchez. Surridge. Lindelof was the target. against Manchester United, lost 2-1. Just a goal down here with Yeovil. better, Yeovil, when they get it. have to keep that under control. who play at a lower level. get it under control either. Rashford in the central role? he plays on the left. United's second. It's a corner. That's what he's good at, Rashford. such a graceful mover, isn't he? defending to stay on his feet. make it. It wasn't reaching Zoko. seem to have affected him. can drive down the left-hand side. I'd like to see him do more of that. be coming to an end, is it? injury. He's coming back in. chance to get back in. first time. It Sanchez's debut. was, then headed away by Smith. Two team at the moment. but the flag is up. ago. Jake Gray, the Spurs fan. made it 2-0 to Manchester United. queueing up there, Man United. are looking over at Lukaku. sight for the Yeovil defence. three and scored against Derby. win at Burnley, and start tonight. A decent night's work for Mata. this is a look to the future. Sanchez will do, he will punish you. coming up for Manchester United. to keep him sharp for that one. the head of Nathan Smith. Sanchez, somehow. He's a top player. Motherwell to sign for Yeovil. hour and a half before kick-off. Motherwell. Hasn't scored a goal. for the short corner here. in the end. Here he is again. His dummy didn't fool Rhys Browne. last just past the 71st minute mark. his new team-mates and new manager. first minutes under his belt. bad replacement, Lingard coming on. He's done all right recently well. for Manchester United at Wembley. goals this season as well, Lingard. Rashford closing price Diack down. passed the ball really well. where they are suffering a bit here. shot comfortably held by Romero. himself. Big game for him. exciting enough for all generations. that last bit of energy. score and they are looking ominous. Lingard trying to set up Rashford. players almost fell on the ball. and just makes the foul. minutes of this game. -- Darren Way. is behind this free kick. try. He was not short of confidence. Rojo. The clearance to Shaw. and almost got it back. game. This is Rashford and his pace. his first season with the Yeovil. Rojo into the path of Rashford. pace from Rashford is exceptional. keeper cannot get near to him. one. For the second time. he has attained one in the end. has been at the club. for every away game now. by Herrera. Here is Lingard. Gomes. was pulling a hold of him. influential player on this game. does to the maximum. Herrera. away trip, nice day out to Yeovil. miss. Good for his confidence. on debut for Alexis Sanchez as well. in the last 20 minutes of that game. was the goal that really killed it. win. He will be a big player. made you work hard tonight. seemed to be bang on this evening. tough game. We reacted well. Everyone was ready to work. where is the best place to play in? think today we all did well. Good to talk to you both. lot of the first half. to attack teams. He tries passes. want to be the other one. Mourinho is waiting and it is cold. play? It is not about that for us. difficult. Not an easy one for him. I am happy with his performance. they are and what they are made. between them staying in League Two. to remember. This is an opportunity.